From the get-go, it’s sounded like Hollywood’s live-action Monster Hunter movie wasn’t exactly going to be a faithful adaptation of the popular games. Set photos continue to underscore that. The movie is about a UN military team that ends up in another dimension which is overrun with monsters. Jovovich meets a hunter, played by Tony Jaa, and they join forces to save the world or something. That sounds the first part of the movie will have Jovovich using modern military weapons but learning how to use more traditional Monster Hunter type weapons as the plot progresses. 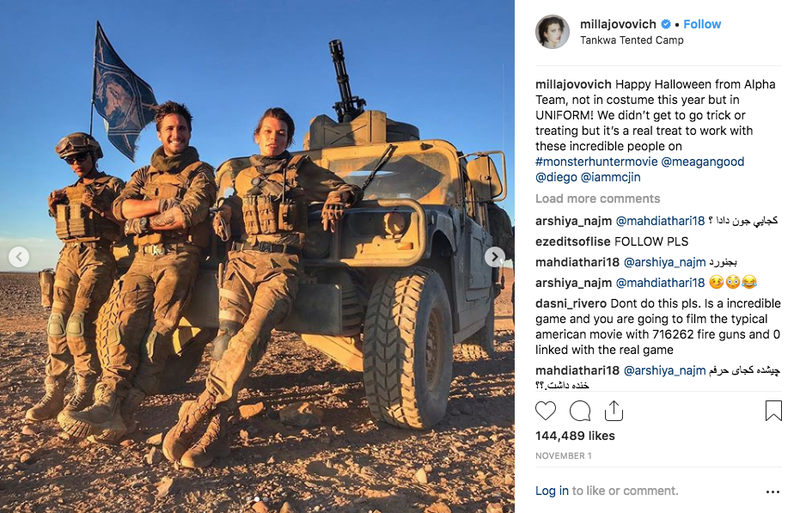 Star Milla Jovovich has been continually updating her Instagram with set pics, which have mainly been images of modern military gear and hardware as well as Jovovich wearing a Slinger. One Japanese Twitter user pointed out that Monster Hunter had already seen modern weapons. These changes shouldn’t be that much of a surprise considering how the Resident Evil films spun off into their own thing.